Tree roots? In your sewer line? It’s more likely than you think! At A1 Sewer & Drain Services, we have the solution. Call us any time for hydro jetting and sewer repair in NJ, at 201-645-0888. Tree roots in the sewer line are a leading cause of cracked sewer pipes in nj. As many as 80% of sewer blockages and broken sewers in Bergen County and Morris County are caused by tree roots. The sewer backflow that can result from a clogged or broken sewer line is one of the leading causes of residential water damage, which is itself a leading cause of sewer repair services and homeowner’s insurance claims. According to the American Insurance Association, 40% of US homeowners have reported property loss from water damage, and a large percentage of these claims were sewer backups that could ultimately be attributed to tree root incursion. 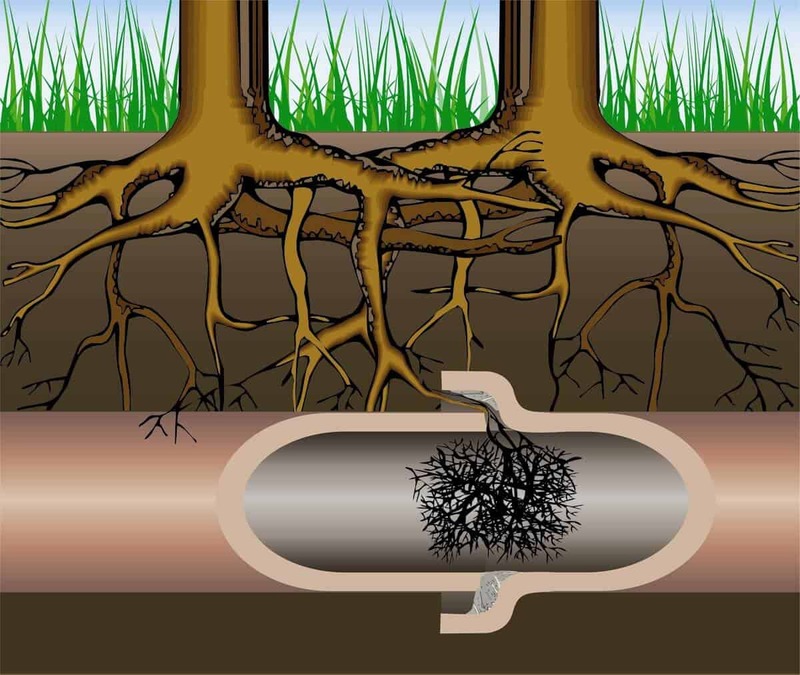 Not only are tree roots one of the most common causes of sewer pipe damage, but that damage tends to be relatively serious, and requires professional sewer repairs from an experienced NJ plumber. 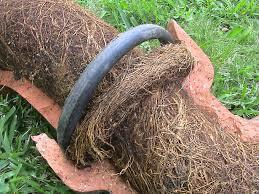 In a best case scenario, tree roots merely clog the sewer pipe, and need to be removed, usually with sewer jetting. In a worst case scenario, ongoing damage can lead to a catastrophic sewer pipe collapse, which needs sewer line repair or sewer line replacement. 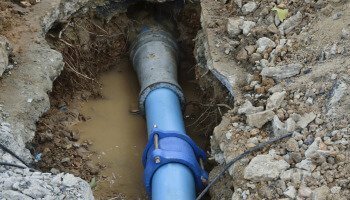 Because sewer pipes are concealed beneath the ground, homeowners often don’t realize that there’s been any damage until the problem gets serious. Common warning signs like slow drains and sewer smells can tip you off that something’s wrong with your sewer line, and you should call a local sewer repair plumber as soon as possible. There are a few ways that homeowners can help prevent tree roots from growing into a sewer pipe, but these aren’t always reliable. Eventually, you may need sewer repair for tree root incursion in NJ. When that time comes, give us a call any time at A1 Sewer & Drain Services for 24-hour emergency repairs. We’re always available to help you solve your sewer problems quickly and effectively. Need sewer repairs? Call us today at A1 Sewer & Drain Services, at 201-645-0888. 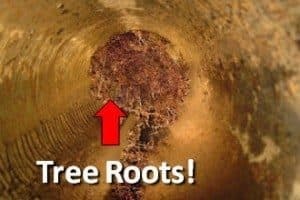 Why Do Tree Roots Grow In Sewer Pipes? Tree root damage to a sewer line can happen to anyone, even if you’re usually careful about regular sewer maintenance. Tree root incursion usually begins when a pipe already has cracks or holes. This can result from loose pipe joints, corrosion, or other problems. Although small pinholes or cracks may not lead to disruptive underground water leaks on their own, they can provide a pathway for roots to enter the pipes. Old, tall trees are common in Bergen County and Morris County— both coniferous pines, and deciduous trees like oak or birch. The root system of a typical mature tree can be surprisingly large, extending anywhere from 2 to 7 times as wide as the height of the tree itself. Trees also grow their roots continuously, sending out small new shoots. Plants are biologically capable of sensing and reacting to environmental conditions around them. Tree roots grow toward moisture and nutrients, and shy away from dry regions and nutrient-poor soil. The species of trees most likely to clog your pipes are those which are adapted naturally to moist soil conditions, such as willow trees, poplars, and silver maples. Unfortunately for New Jersey homeowners, sewer pipes have exactly what tree roots naturally “look” for: moisture and nutrients. When there’s a minor crack in a sewer pipe, the warm moisture and water vapor that leak out will attract nearby root systems (which can be attached to trees that are hundreds of feet away). Once the roots have entered the sewer line, the moist conditions and presence of organic nutrients create perfect conditions for rapid growth. This is great for the tree, but not so good for the pipes. 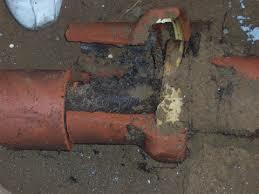 The rapid root growth quickly clogs up the pipe, blocking water flow and leading to sewer backups. As the roots enlarge, they can also enlarge breaks and cracks, potentially causing sewer pipe collapse in extreme scenarios. Because tree roots can cause serious damage to your sewer line, you’ll want to get sewer repair service for broken pipes as soon as possible. The longer you ignore the problem, the worse it will get, a cracked sewer pipe can turn into a sewer line collapse, so it’s important to get it taken care of quickly by a NJ plumbing contractor. To spot problems sooner, annual sewer camera inspection can help find tree root incursion early, so that you can get repairs before you even notice signs of a problem. To get sewer inspection, sewer cleaning, and other preventive measures and solutions for tree roots in your sewer main line, call us any time at A1 Sewer & Drain Services, at 201-645-0888. We offer same-day service for sewer and drain repairs, helping you take care of your problems as soon as they arise. Need sewer repairs? Call us today at A1 Sewer & Drain NJ Contractors Sewer Service, at 201-645-0888. Slow drains throughout your home. When the nj sewer line is clogged, all of your plumbing will show signs of a clog. Drains in your sinks, showers, and bathtubs won’t empty as quickly as they should. When the problem is suddenly present in all your drains (in more than one room or area of the house), it’s probably the sewer line, not the individual drain pipes. Drains gurgle or bubble with water when you use a nearby fixture. Does your shower drain gurgle or spit up water when you run the sink or flush the toilet? This is a classic sign of a clogged or otherwise compromised sewer lateral. 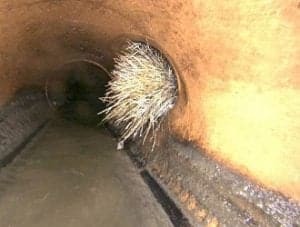 Sewer smells near drains. If your sewer line is clogged, or obstructed because it’s broken, you may notice unpleasant odors near sinks and drains. This is because sewer gases are wafting up your pipes, since water and waste aren’t flowing away into the city sewer mains. Moist areas or sinkholes in your yard. If your sewer pipe has broken, water seeping into the surrounding soil may be visible as wet spots or sunken areas in your lawn. Sinking sewer cleanout. The sewer cleanout is a small, vertical pipe with a black or white screw-on cap. It’s usually located near the edge of a house or building. If you’re having serious sewer problems, the cleanout will often sink downward. It can also fill up with water, and neither is a good sign. If you’ve noticed any of these problems in your home, something is wrong with your sewer line– and it might be tree roots in the sewer pipe. To be sure, and to get the problem taken care of, you’ll need to call a NJ sewer plumbing company to inspect your sewer and, if needed, perform sewer cleaning or sewer repairs. Sewer repair for tree root incursion starts with removing the roots that have made their way into the sewer pipe. The best way to do this is generally to use hydro jetting. Hydro jetting is a sewer cleaning technique that uses high-powered hydraulic water jets to cut through and remove debris that’s obstructing a sewer main line. Sewer jetting carries little to no risk of damaging the pipe, and the process can take as little as half an hour to complete. To clean out a sewer line, sewer plumbing contractors in Bergen County and Morris County use professional hydro jetting equipment. Hydro jetters are a tool of choice for sewer cleaning contractors because they’re safe, effective, and easy to use for professionals. These systems include specialized pumps, hoses, and nozzles, similar to a pressure washer. Hydro jetting equipment can generate water pressures up to 4000 PSI, emitting up to 25 gallons of water per minute at high pressures and speeds. This is sufficient to cut through even the toughest tree roots. The heart of the sewer jetting apparatus is the pump, which takes the water supply and pressurizes it, sending it into the hose. The pump can generate astonishing water pressures. To put things in perspective, a stream of water at 2,000 PSI is capable of peeling the paint off your car. The pressures used can be up to 4,000 PSI, depending on the size of the pipe that’s being cleaned. Larger pipes require higher pressures, while small pipes can often be cleared out with a commercially available mini-jetter. As the water jetting breaks apart the roots, they’re washed away downstream in tiny pieces. Hydro jetting can clear out a sewer line completely, eliminating root growth, sludge, grease, and other debris. When tree roots are too thick to be cut apart with hydro jetting alone, sewer repair contractors may use a cable machine with a special blade attachment designed for cutting roots. The water pressure from the jetting pump rotates the blades at high speeds, cutting away roots and other tough obstructions. To find out more about hydro jetting for sewer cleaning and tree root removal, or for emergency sewer cleaning for a clogged sewer pipe, call us any time at A1 Drain & Sewer Service NJ. Using state of the art equipment, our experienced NJ sewer plumbers can clear anything out of a sewer pipe, even the toughest hardwood roots. After removing the tree roots from the sewer pipe with hydro jetting, we can use sewer video inspection to look for damage. We can find the cracks or holes that provided the original entry points for the roots, and provide sewer relining or other sewer repair services to patch holes and stop leaks. NJ sewer relining is a way to fix your cracked sewer pipe without digging up the whole sewer line. When tree roots enter your sewer line through small holes or cracks, sewer relining is often a viable solution to fix the pipe and prevent further root intrusion. 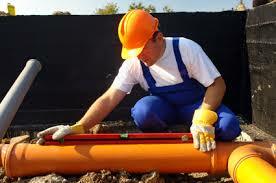 Sewer relining uses special fiberglass cloth and epoxy pipe liners. Although they’re soft and flexible so they can be inverted or pulled easily into the pipe, they can be hardened in place with heat or UV light. Once the process is complete, epoxy pipe lining creates a new sleeve inside the damaged sewer pipe, creating a watertight barrier between the interior and the holes or cracks on the old pipe surface. Sewer relining is a preferred sewer repair technique for many NJ sewer plumbers. It eliminates many of the problems associated with nj sewer excavation, including damage to driveways and lawns. With trenchless pipe lining, contractors only need to dig a small entry point, instead of a large trench that exposes the entire sewer pipe. If your sewer pipe has collapsed or broken badly, you may actually need sewer replacement service. 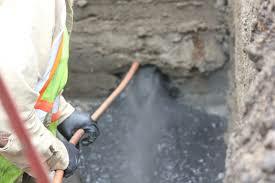 Although sewer replacement sometimes requires sewer excavation, we can often use pipe bursting instead. Pipe bursting is a trenchless sewer repair technique that uses a hydraulic bursting head to break apart a severely damaged sewer pipe, then pull a new section of pipe into place behind it. To find out more about pipe bursting and other options for sewer pipe replacement, call us any time at A1 Sewer & Drain Services. Root extracting chemicals. 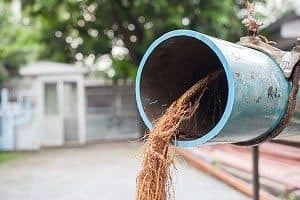 There are many environmentally safe chemical preparations that you can use to prevent roots from growing inside the sewer pipe, especially if you’ve had root problems before. First, the blocked pipe needs to be cleared with hydro jetting, and examined with a sewer video inspection camera. Then, after the roots have been cut, chemicals can be applied to the inside of the sewer line. These root killers contain herbicides that kill roots. You may need to wait a couple of months after tree root removal from the sewer pipe before having a NJ sewer plumber apply chemicals. This is because right after roots have been cut, the tree will generate sap to heal the wound. This sap can make herbicides less effective. Plant sewer-friendly plants. When landscaping, it’s a good idea to know exactly where your sewer main line is located. Small shrubs and forbs (flowering plants) don’t have strong, woody roots that can cause serious damage to your sewer line. Remove large trees that are too close to your sewer line. You may want to remove a large tree if it’s way too close to the sewer pipe. However, tree root incursion can happen from the root systems of a tree that isn’t even on your property. Get annual sewer inspection. Sewer camera inspection for sewer maintenance can help you spot problems early, so that you can get repairs sooner and avoid serious problems later on. At A1 Sewer & Drain Services, we’re available 24/7 for same-day sewer repairs, sewer cleaning, drain repairs, and more. Serving both homeowners and NJ businesses in Bergen County, Morris County, and beyond, we provide quality sewer service from NJ plumbers with years of experience and training. To find out more, or to get sewer repairs today, call us any time at 201-645-0888.